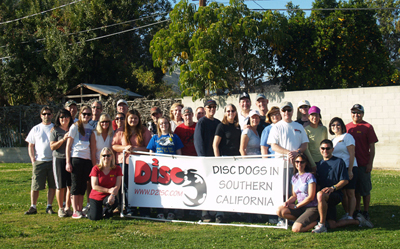 Since 1997, Disc Dogs in Southern California (D²I.S.C.) is a group of disc dog fanatics whose main purpose is to have fun while promoting canine disc as a great way to keep family pets happy, healthy, and in shape. We organize a series of informal playdays and clinics throughout the year where our members and prospective members exchange training ideas. We also hold several competitions which are a great place to have fun and strut your stuff. We perform a variety of shows for dog related charities, humane societies, sporting events, and schools throughout the year. Several of our members are Regional, National, and World Finalists in competition, so our events are a great place to learn the ropes from some of the top teams in the country. Check out our event schedule, and we hope to see you at the park soon!